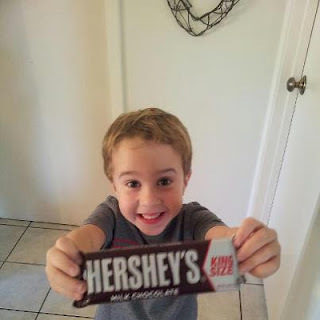 Here is my little man yesterday, proudly displaying his Hershey "CH"ocolate bar. He was so proud. My mom brought it by for him as a special congratulations. 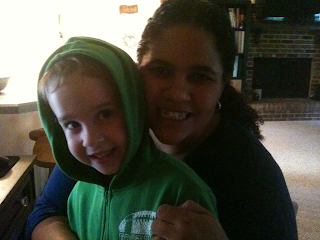 After a year of speech therapy he finally said the "ch" sound this last week. Now, this isn't the first time he said a new sound, but this was a huge step for him. You should have seen his face beaming. He knew that it was a big deal. And as you can see, we made it a big deal!!! 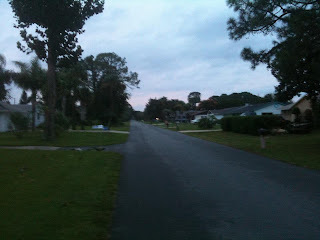 I snapped this picture early this morning when I was about 1/4 way through my 5 mile run. The sun was just peaking through...but it was struggling. We have Hurricane Sandy hanging around this weekend, so we had some wicked cloud cover. And the wind. Oh my the wind has been crazy. Lots of rain last night, but tons of wind for the past few days. We are just glad that we didn't get a direct hit from the hurricane. Had a great run this morning. Wasn't feeling it when I started. But I went out because it was scheduled and sometimes you have to do what you have to do. And about this point of the run I felt really good. I knew it was going to be a good run. No struggle. No mental block. I felt good. My body felt good. I am glad I persevered through the first step and ran. It made my day. Just a few shots from the past week. Some of the kids...a game of checkers or two...a bike ride or two...a first run for my William (he wants to train for his first 5k)...Esther behind the camera planning her entry for the County Fair...and the girls and I wearing our boots for the first time this season. Take a moment and make those memories. It's worth every second. And check out Emily over on her page and see her Embracing the Camera. Happy Monday to you all! Another Monday has arrived. A good thing? Yes. A bad thing? No. We had an uneventful weekend...which is the way I like it. We did a lot of hanging out...a little running...some watching of our new favorite show "Parenthood"...a whole lot of nothing. Which for now, my husband is in the midst of his busiest selling season (medicare season), so he likes to lay low on the weekends because the weeks are so crazy. And because my kids take so much of my energy during the week...so I like to lay low too. I got to run 2x this weekend...which is nice. I starting running at different times so that I won't have to run in the dark anymore. So I did a nice 5 mile run on Saturday. The temps were nice and it was the perfect way to start the weekend. And then last night I did an extra short run (under 2 miles) but I was able to run my fastest ever. It was a good running weekend. Embracing the camera this morning. Esther just snapped this picture of us this morning. My little bear and I. He just had me zip up his jacket. 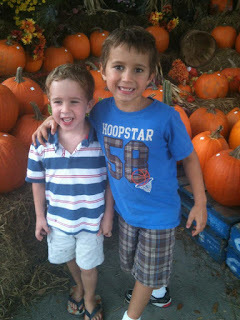 I think my kids have been in Florida too long...if it's 70 degrees or below they think they need a jacket. They are enjoying the cooler fall temps this morning...if they can get some fun time on the swing set before school, they go for it. Anyway, love this little boy. Gosh I am blessed. Take a minute today and get in the camera with your kids...don't let the moments flash you by. And stop over and see Emily and her crew. It's four o'clock in the afternoon and it has been a fantastic day. Started the day with wide open windows...the first time this season. It is so refreshing, especially after being cooped up all summer with the A/C on. It was actually funny to sit here during school time and hear all the little noises that the outside produces. I actually kind of enjoyed it. This is where I was tonight...out with the best kids. We went 2.5 miles and it was great. No place I would rather be! Have a great week!!! This is a typical pose at our house...one trying to strangle the other...haha. They are so sweet. Eating ice cream...they sure did a lot of eating. The ice cream cones are huge! Looks yummy! Yes, today is my day. The day I have thought about for months. 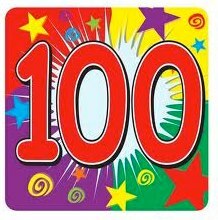 I reached my 100 pound weight loss goal when I stepped on the scale this morning. It has been looming...teasing me for awhile. My weight loss had slowed down a bit (I think because I wasn't eating enough and because my workouts were seriously stepped up)...so it has been a rough couple of weeks. It doesn't matter now. Today, I hit where I wanted to be. Does this mean that I am done? Not a chance. I am continuing to live this lifestyle forever. It feels too good. 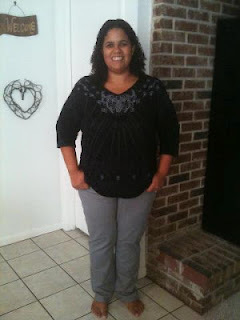 I still have more weight to lose, but that will come. I am on track with my 10k training (only a few weeks to go) and I am working out in other ways. 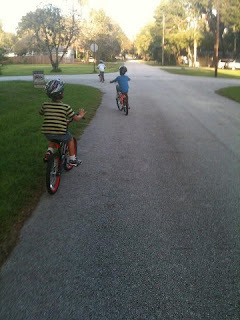 Including riding bikes with my kids in the evening. Isn't this the best life? So, for my birthday my kids got a bike for me. I asked a million times and they listened. 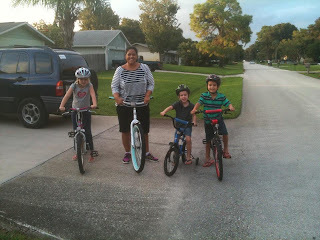 Of course, it was to their benefit because now I will take them on bike rides. On the first cool night this week I took three of them out. Three kids was a lot to take out by myself on the streets. They all bike at different paces, so it was hard to keep track of them. And then there was little boo-boo head (aka Judah). He almost killed me a dozen times. 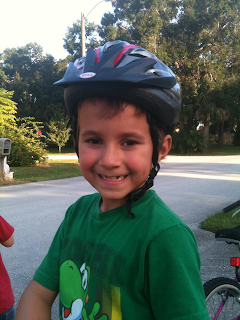 He couldn't go very fast (he didn't get much bike practice at our old house because of the soft sand) so I stayed behind with him. You can see in the picture how far up the other kids are. Well, he kept on stopping and I would almost plow into him or he would focus on something on the side of the road and steer into me or oncoming traffic. It was a bit of a frightful scene. We turned around 1/2 way to my original destination...which I am glad I did because Judah's little legs got really tired. Oh Monday...how sweet are you? Or sour? It is hard to come to Monday when you had such a great weekend. I think I would have liked to have stopped it last night and enjoyed the last few moments. To freeze time? Just for a day. 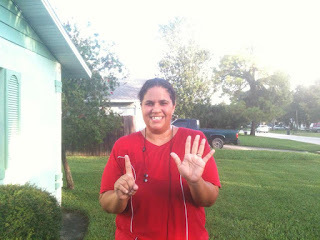 On Friday I ran my first consecutive 6 mile run!!! Yahoo!!! WooHoo!!! It was awesome. I can't believe it!!! I ran my first 5 mile run about a month and a half ago. And my goal was to run the six miles once I hit the month of October. And that day came quickly. And it landed on the most perfect day...the day after my 37th birthday. 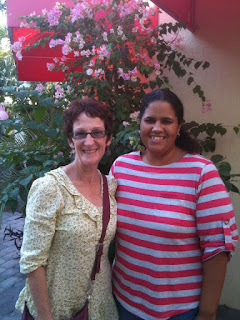 It was a true reminder to me of how far I have come since my last birthday. I am so amazed by how far the Lord has taken me. Today is my day. My favorite day of the year! It's my birthday. 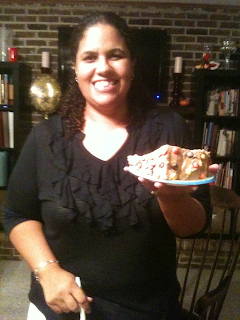 Though I don't like the number I am turning...how is it possible that I am 37...I am so blessed and excited for life! This past year has been ONE of the best years of my life. I can't remember having a better year. I am so excited for the future and I am truly experiencing freedom. This is the first year in my life that I am no longer being controlled by food. That feeling is awesome. I am in the best physical condition that I have ever been in. I found a new passion...running. Never thought I would be a runner, but I am loving it. And I love how it makes me feel. God told us that we were entering a new season...and He has been so right. It's been an incredible start and I am ready to push forward and see what He has for us. So, Happy Birthday to ME! 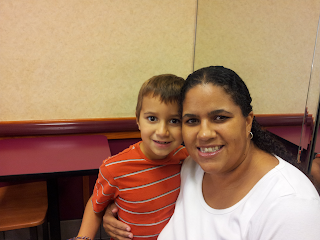 This morning Matt and I took William for a quick date to one of his favorite places, Dunkin Donuts. He had been working on a certain behavior and after he was able to go a whole week with his change we took him out for a quick breakfast as a reward. 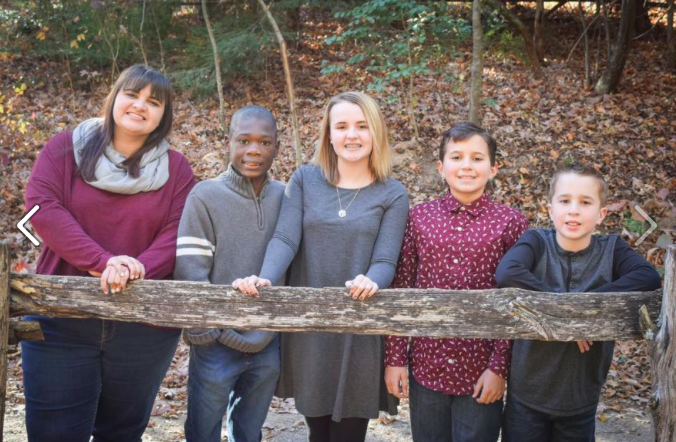 I have found in the past 15 years of being a mom that incentives work like a charm with my kids. The reward doesn't have to be food or even cost any money. It can be a special outing or an evening watching a movie in mom and dad's bed. I have to post something today, because today is the first day of the best month of the year. October, how I love you. I adore you. And of course this is the month of my birth....so you are incredibly awesome. Haha. I know I love it so much because of my birthday, but I know I like it more because of my early memories growing up in New York. It was simply lovely then. The leaves were changing. The air was crisp and cool. Oh, I could get lost for a moment here. But I won't...focus Allison, focus. Simply stated, this is the best month. It is the pathway to the holidays and for cooler weather. Which we really appreciate here in Florida. Happy October to you!!! * I am posting a picture I sent my husband the other day...don't pay attention to the price tag...I was just showing him what I want by our front door. 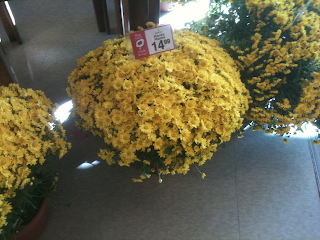 When I see a cluster of mums, I think OCTOBER!